Hidden Figures uncovers the incredible, untold yet true story of a brilliant group of Wonder Women who changed the foundations of the country for the better — by aiming for the stars. The film recounts the vital history of an elite team of black female mathematicians at NASA who helped win the all-out space race against America’s rivals in the Soviet Union and, at the same time, sent the quest for equal rights and opportunity rocketing forwards. Everyone knows about the Apollo missions. We can all immediately list the bold male astronauts who took those first giant steps for humankind in space: John Glenn, Alan Shepard and Neil Armstrong. Yet, remarkably, Katherine G. Johnson, Dorothy Vaughan and Mary Jackson’s are names not taught in school or even known to most people — even though their daring, smarts and powerful roles as NASA’s ingenious “human computers” were indispensable to advances that allowed for human space flight. Director Theodore Melfi (St. Vincent) brings the women’s rise to the top ranks of aerospace in the thrilling early days of NASA to life via a fast-moving, humor-filled, inspiring entertainment that illuminates both the gutsy quest for Earth’s first, seemingly impossible orbital flight and also the powerful things that can result when women unite. For all its joys and triumphs, Hidden Figures is also a film that takes place at the crossroads of the most defining struggles in American history: the evolving fight for Civil Rights; the battle to win the high-stakes Cold War without risking nuclear war and be the first superpower to establish a human presence outside planet Earth; and the ongoing drive to show how the mind-boggling technological breakthroughs that create the world’s future have nothing to do with gender or background. Touchingly, Katherine G. Johnson, now in her 90s, finds the growing fascination with her life’s work and that of her fellow compatriots a surprise as she says she was always just doing her best for her job, her family and her community, as she believes anybody would. “I was just solving problems that needed to be solved,” she says with characteristic modesty. Screenwriter Allison Schroeder, who not only studied high-level math but interned at NASA, following in the wake of her grandmother, a programmer at NASA from the early days through the shuttle program, and grandfather, who took part in the Mercury project. Much as Schroeder knew about NASA history, she, too, had never encountered the names of Katherine G. Johnson, Dorothy Vaughan and Mary Jackson. She couldn’t believe this inspiring story of women’s empowerment in the world of space science had been buried out of her sight, even as an insider. 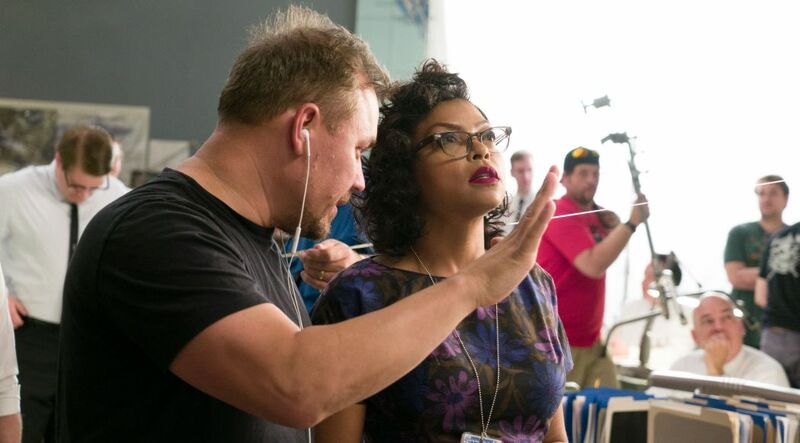 At last, the story of a visionary trio of women who crossed gender, race and professional lines on their way to pioneering cosmic travel comes to the screen starring Taraji P. Henson (Empire, Benjamin Button, Hustle And Flow), Octavia Spencer (Allegiant, Fruitvale Station, The Help), singer Janelle Monáe making her motion picture debut and Kevin Costner (Black Or White, Field Of Dreams, Dancing With Wolves). Few accomplishments in American history have been as celebrated as the nation’s space program and those first soaringly idealistic journeys to take humankind into the cosmos we’d contemplated since history’s dawn. President Kennedy has been hailed for galvanizing the country to dream big; the astronauts who flew the perilous early flights into the unknown have become icons; and the meticulous male NASA engineers at mission control have been lauded for their grit and tenacity under pressure. Yet there remain unsung and unlikely heroes of the space race – particularly, a team of female mathematicians who blazed multiple trails, trails towards greater diversity in science, equality in America, for human mathematical achievement and to launch John Glenn into mesmerizing orbit at more than17, 000 miles per hour as he circled three times around the globe in space. It was a time in the country when opportunities could seem unjustly limited – that was true if you were a woman, if you were African-American, and especially if you were an African-American woman. Yet these dazzlingly smart NASA women flouted the limitations without fanfare, redefining the entire idea of what was possible – and who is vital to the nation — by proving themselves absolutely essential to America’s future. For Katherine G. Johnson, Dorothy Vaughan and Mary Jackson, the chance to use their knowledge, passion and skills opened up just as the demands of World War II were shifting the nation’s social fabric. On the factory front, women were suddenly invited to become Rosie the Riveters. Less famously, the same thing was happening in science and math. Faced with a daunting shortage of male scientists and mathematicians and with new laws prohibiting racial discrimination, defense contractors and Federal Agencies began seeking out women and African-Americans with the skills to keep pushing essential research onwards. At the Langley Memorial Research Lab in Hampton, Virginia – run by the National Advisory Committee on Aeronautics, or NACA, a precursor to NASA — the search was on for luminous minds from nonconventional backgrounds. They needed gifted people to serve as “human computers” – that is those rare people with the grey matter to complete rapid-fire, advanced calculations in their minds, before we had digital super computers that could precisely plot out rocket trajectories and re-entry paths. The stakes felt high to all Americans. In 1958, the Soviet Union launched their pioneering Sputnik satellite with a bang – claiming they now had the superior edge in the raging Cold War between the two nations. This catapulted the space race into the number one U.S. priority and preoccupation. Millions watched the race unfold, hoping America would be able to prove its strength as a society by beating the Russians into orbit and all the way to the moon. In a time when fear of a hot, civilization-annihilating nuclear war was at a high, the space race became an alternate path for the USSR and the U.S. to compete no holds barred. Both nations saw it as a chance to prove their system had the greater potential, as well as to reap new military and intelligence-gathering benefits, and become the first country to establish a sphere of influence beyond our globe. By 1960, John F. Kennedy was running for President on an inspiring platform of closing the gap in the space race and taking the lead with American ingenuity. It was in this context, that NACA became NASA and all of its scientists and mathematicians, including the “human computers,” shifted into the space program at high velocity. Despite the Jim Crow laws still undermining equality and human rights in Virginia, Langley hired an entirely female team of these “human computers,” a number of whom were African American math teachers. They remained segregated, with black women eating in separate quarters and working apart in a remote division known as West Computing. They were paid less than their white counterparts. Yet, their extraordinary work rose above – and ultimately so won over the men in their midst that they became utterly indispensible to the boldest mission yet: putting John Glenn into full orbit around earth. Vaughan was equally accomplished, a Missourian who graduated from college at 19 and worked as a math teacher before joining Langley in 1943. She quickly became the head of the West Computing group. Jackson was a local from Hampton, Virginia with degrees in Physical Science and Mathematics. She rose to Aerospace Engineer after joining Langley in 1951, specializing in wind tunnel experiments and aircraft data, always using her position to help others. It stunned author and executive producer Margot Lee Shetterly, whose father worked at NASA, that these women remained relatively unknown. Shetterly wrote her novel Hidden Figures based on oral interviews, extensive research and archival information, chronicling how the women of West Computing met the challenges that faced them with grace and optimism, forged alliances that helped them gain respect and aided one another to change their own lives even as they were changing the country and technology forever. She also founded the Human Computer Project, which has received two grants from the Virginia Foundation for the Humanities, an organization dedicated to archiving the work of all the women who contributed to the early history of NASA. Bonding closely together helped the women find strength, says Shetterly. “They were a band of sisters. They knew they had to support each other and they encouraged each other to give 150% because they also knew they were going to be scrutinized in a different way. I think they saw they had a rare chance to open doors to other black women in a future that would be different,” she concludes.